Empty and clean birdbaths and pet’s water bowls at least once to twice a week. Always use repellents according to the label. Repellents with DEET, picaridin, oil of lemon eucalyptus, para-men-thane-diol, and IR3535 are effective. Clothing – Wear shoes, socks, and long pants and long-sleeves. This type of protection may be necessary for people working in areas where mosquitoes are present. 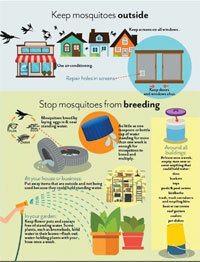 Repellent – Apply mosquito repellent to bare skin and clothing. See Tips on Repellent Use below for additional instructions related to children. Products with concentrations of up to 30 percent DEET (N, N-diethyl-m-tolua-mide) are generally recommended. Other U.S. Environmental Protection Agency-approved repellents contain pic-aridin, oil of lemon eucalyptus, para-menthane-diol, or IR3535. These products are generally available at local pharmacies. Look for active ingredients to be listed on the product label. DOH continues to conduct statewide surveillance for mosquito-borne illnesses, including West Nile Virus, Eastern Equine Encephalitis, St. Louis Encephalitis, Malaria, Dengue Fever and Zika. Floridians are encouraged to report dead birds via the website for Surveillance of Wild-bird Die-offs, located at http://legacy.myfwc.com/bird/default.asp. Rumor Control Hotlines: Broward County, 311 – (954) 831-4000 or www.broward.org/hurricane. Florida – 1-800-342-3557.